HBS leverages food buying power to promote higher-welfare farms. BOSTON—Harvard Business School (HBS) has joined Farm Forward’s Leadership Circle. Farm Forward is a non-profit that promotes conscientious food choices that support humane treatment of animals and advance sustainable agriculture. Increasing the humane treatment of animals also has a positive impact on human health since over 80% of antibiotics sold in the United States are used to treat farm animals living in cramped conditions. This contributes to antibiotic resistance in humans according to the Center for Disease Control. 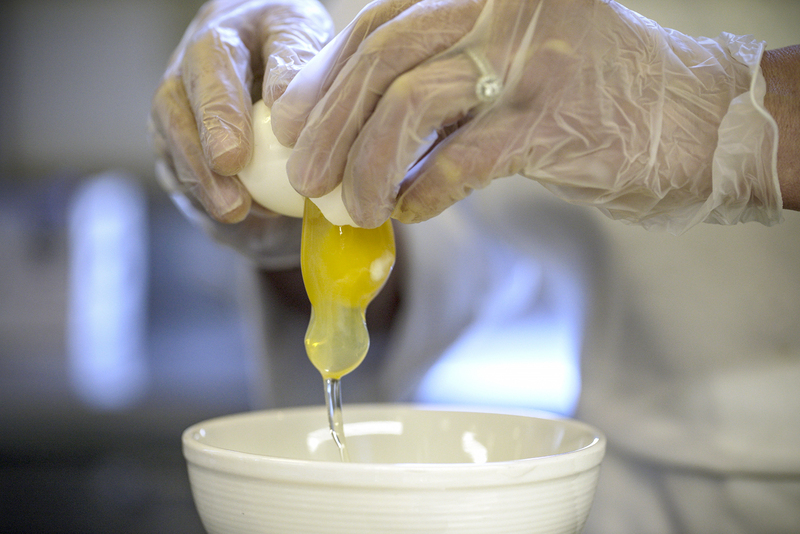 As a member of the Leadership Circle, HBS has committed to buying 100% of its eggs – both liquid and shell – from farms that are certified higher-welfare and align with the Leadership Circle’s sourcing requirements. In addition, HBS will look for ways to support farmers and ranchers who raise animals to the highest level of welfare. “Business leaders from around the world look to Harvard Business School as the gold standard. We applaud HBS for making farmed animal welfare a core part of values-based food purchasing policies and hope they inspire others to follow suit,” concluded deCoriolis. To implement these changes, HBS partnered with their on-site dining management company, Restaurant Associates – a member of the Compass Group. Restaurant Associates has been a key partner in this process, working to identify higher-welfare farms and suppliers and changing their purchasing to accommodate these commitments. “HBS would not be a Leadership Circle member without the support of our dining services partner Restaurant Associates,” said Robert Breslow, Senior Director of Administrative Services at HBS. HBS is also actively seeking ways to incorporate more plant-based items to their menu to promote more healthy and environmentally-friendly dining options. HBS provides plant based food options, which are healthier and have lower greenhouse gas emissions associated with them. Once a week, the hot bar in the main dining hall, Spangler, consists of entirely plant-based options through the Menus of Change program in addition to the daily plant-based hot bar in the Grille. Menus of Change is an initiative that was founded by the Culinary Institute of America and Harvard’s T.H. Chan School of Public Health with the goal of “integrating optimal nutrition and public health, environmental stewardship and restoration, and social responsibility concerns within the foodservice industry and the culinary profession”. The pastry chef also features a plant-based dessert to highlight how delicious and decadent plants can be. In order to promote these changes in the dining hall amongst the students, the Student Sustainability Associates ran a vegetarian recipe contest. Winning recipes were selected and prepared for dinner and students were able to vote on their favorite. Both dining halls on campus are also Green Restaurant Associated certified. When possible, HBS donates leftover food through an organization called Food for Free, which distributes to shelters and other places in need. Moving forward, HBS will continue to search for ways to sensibly incorporate higher welfare items as well as plant-based food options into their dining services. HBS is committed to continued progress to improve the health and sustainability of our food system on campus. Farm Forward is a team of strategists, educators, campaigners, and thought leaders guiding the movement to change the way our world eats and farms. They implement innovative strategies to promote conscientious food choices, reduce farmed animal suffering, and advance sustainable agriculture. Farm Forward is pushing the ceiling of animal welfare by looking beyond incremental suffering reduction on factory farms, towards the institutional and cultural change that will end factory farming.